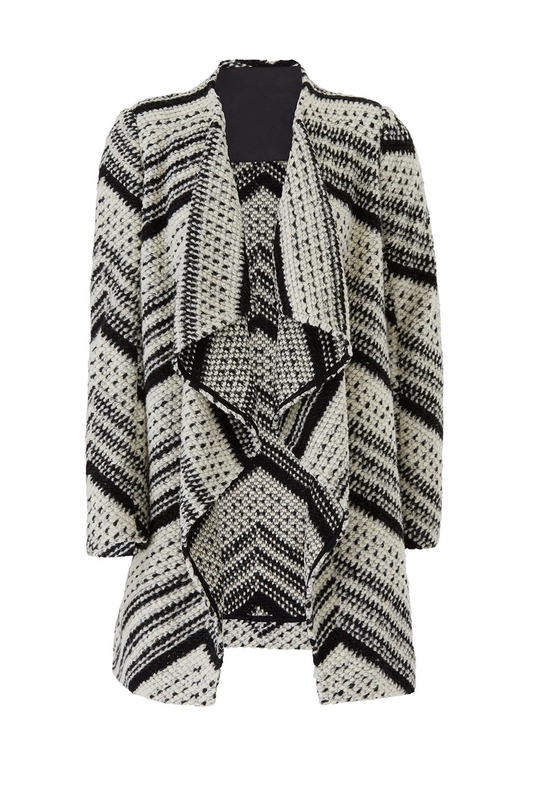 Black-and-white stripes embolden this relaxed drape-front ba&sh cardigan cut in an extra-chunky (and cozy) knit. 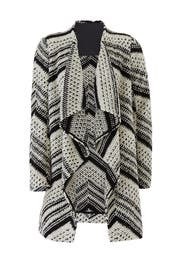 White and black knit (58% Polyester, 30% Acrylic, 12% Wool). Cardigan. Long sleeves. 35" from shoulder to hemline. Imported. Wore this to a fall bonfire. Was perfect - very warm and right for the occasion. I love this sweater! It's almost more like a coat because it's so warm. The shoulder pads give it additional structure that makes for a nice winter work outfit. You can also dress it down with jeans and flats. I can see how some might not like the shoulder pads. I think if you size down that will help make it feel less bulky. I've worn this three times and am contemplating keeping it even longer. The open front drapes nicely. The knit is warm but not stuffy at all. It can itch a little but I wore it with a long sleeve shirt beneath and had no problems. I am broad shouldered but didn't find the padding problematic at all, kept a good shape. It did leave fibers on my pants but nothing unmanageable. I'm 5'3" and have only worn it with chunky heels since it does come down to past my fingertips. I've already worn it twice and will likely wear again before returning as part of my unlimited subscription. The fit is large, and the material is a bit itchy. I do not care for the shoulders- kind of like shoulder pads like in the '80s. This was one of my favorite pieces. 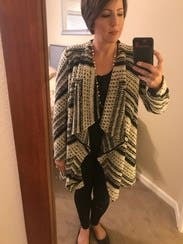 I was able to wear it to work and out on the weekend without it being overly dressy. I also love that it was super warm and cozy. It was a little bit bigger than I expected for it to be a medium though. We're this during a cold snap for church and a day out - got lots of compliments. Warm and comfortable and a good choice for the middle of winter. The sweater is really pretty and warm. With a long sleeved top it works great but I was too hot. I wore it to work with a T shirt and had to take it off repeatedly as my arms would get too itchy from the wool. I also found that the wool looked great from a distance but up close was fuzzy with hairs weaved in. This is what I would expect for my own older wool sweaters but not one I'm renting . Cozy, comfy and stylish with little effort. Wore with a black shirt, skinny black jeans and heels. Warm enough so used this sweater as my coat for the day. I love this top and can't wait to wear it again. Great for slightly chilly weather. Had higher hopes for this - it was fine and I wore it twice but didn't love it. Runs bulky so ordered a small instead of medium. Sleeves a little short, but it was workable. Huge, huge, huge. Size down two sizes if you don't want to drown in it. Otherwise (in theory) it's cozy and super cute. Pretty pattern! Love this sweater. Perfect for a chilly day. This sweater is beautiful. I am normally a size 0/2 and the XS fits, but it is a larger fit. The material is a little itchy so I wore a long sleeve shirt under it. The pattern is very pretty! This provides the warmth of a coat! I wore it in 40 degree weather with a sweater and felt great. This is definitely large so if you are usually a 4 or below, stick with the 0. I got a lot of compliments and dressed it up and down. I will definitely rent again! The shoulders are quite big, but for work it looked professional when paired with all black. A little too bulky for my liking. Wore it to work over black pants and top. Many compliments. Heavy. Good for cold days. 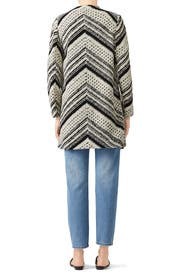 This made for a great casual work outfit paired with black legging jeans and boots. It is definitely a lot of fabric. 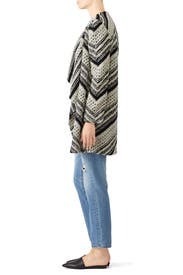 I am tall and can pull it off, but it might be overwhelming on a shorter woman. I didn't care for the shoulder pads -- if I owned it, I would remove them. The sweater is cute and the fit is great -but it's surprisingly heavy and a tad bit itchy. I've never gotten so many compliments on a cardigan. This is really warm and nice for work. I wore it several times because it's so cozy. It's oversized and drapy, but I liked that I could wrap myself up in it. The materials is heavy and nubby. It's good for every day but a little too casual for work. Also, it's long, so it might be too much for a short gal like me. 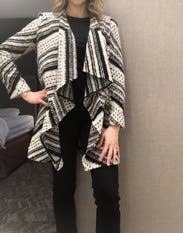 Loved this open cardigan. Wore it several times over the Holidays and received compliments even from strangers! So tempted to buy. I got this sweater for my Snowbunny Bachelorette Weekend in Sun Valley, Idaho. Loved it. 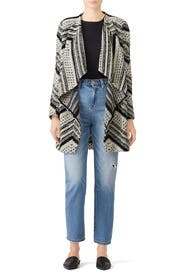 Baggy and comfy sweater perfect as a medium warmth jacket by itself or for layers in colder climates. I wore it multiple times. It is very bulky. Loved the body of the sweater, but sleeves were a bit short/wide at the wrists. I cuffed them and it was fine. Material is a bit itchy - wore a tshirt underneath.